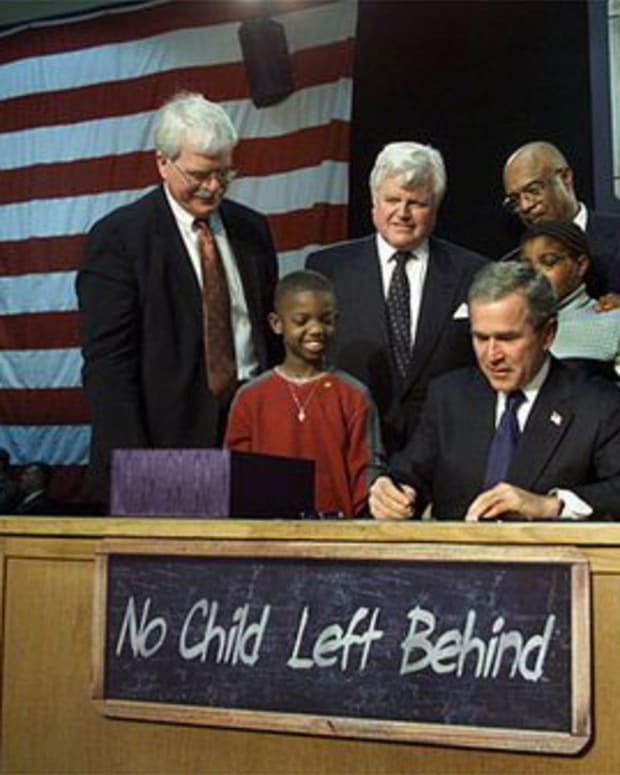 Supporters of the federal No Child Left Behind (NCLB) law use many arguments to defend the controversial law. The strongest-sounding arguments have little to do with the law’s actual provisions, while others are simply false. We have prepared this fact sheet to help people reply to the various claims made in defense of NCLB. All children can learn to high levels. Yes, most children can, but NCLB works against high-level learning. To be successful, students need skills such as critical thinking, creativity, problem solving, communication and collaboration. Good teachers assess these high-level skills and help guide school improvement. Good teachers also know how to teach students who have different backgrounds and learn in different ways. NCLB does not prescribe such strategies. Instead, it relies on standardized tests that measure mainly low-level thinking in a one-size-fits-all format. Pressure to boost scores leads to teaching to the tests, thereby reducing the quality of learning. On top of these problems, schools often lack the resources to teach all students to high levels, while too many students lack access to the health care, nutrition and stable communities that can support learning. Achievement gaps will remain as long as large resource gaps continue. NCLB is a civil rights law. NCLB seriously undermines its civil rights goal of high achievement for all by fostering narrow, dumbed-down, overly-standardized curriculum and instruction aimed at boosting test scores. Children of color and low-income children suffer from this educational malpractice to a greater extent than their more advantaged peers because urban schools serving many groups of children are the most likely to fall under its test-and-punish mechanisms. This worsens our nation&apos;s separate and unequal school system, in which the affluent get a healthy educational diet, while the poor get little more than junk food test prep. NCLB benefits student with disabilities (SWD) and English language learners (ELLs). Like all students, SWDs and ELLs need a rich curriculum and “21st century skills” such as critical thinking, problem solving and communication. Unfortunately many of these students suffer from narrow teaching to often inappropriate tests. While their learning progress should be included in public reporting, SWDs and ELLs individual learning needs must be addressed and assessed fairly and appropriately. NCLB shines a light on low-performing schools. Information on how schools are doing, including results broken down by demographic group, should be publicly reported. But to know which schools are doing well and which ones most need help or interventions to improve, and what kinds of help, requires more and better information than just standardized test scores in reading and math. States and districts have failed to provide all students with a strong education. It is true that schools with the most needy students typically have the least resources and do need help -- but NCLB is not the solution. Many students have unmet needs that make it harder for them to learn, even with good teachers. States and districts can do more to enhance adequacy and equity, but the federal government also must do more. A strong education is not built on preparation for standardized tests. Having common expectations for all solves the problem of low expectations. Children need access to rich opportunities and strong support, as well as high expectations. Narrowing schooling to a focus on tests in reading and math is not high expectations. Common expectations do not require standardized testing in every grade, nor does "high" have to mean "exactly the same for all." Because students best demonstrate their learning in different ways, and because standardized tests are weak measures of many important learning areas, students need a range of different types of assessment. Expecting all students to score proficient by 2014 is a reasonable goal. This claim was defended with the misleading question, "Which student do you want to leave behind?" The reality is that without adequate resources in schools and communities, children will continue to be left behind, as the Children’s Defense Fund points out. Turning schools into test prep programs leaves more children behind. By 2014, most schools will fail, because every year the bar goes up. While strong and consistent progress is possible, the goal of uniform proficiency by 2014 was never achievable, which the law&apos;s architects knew. The impossible goal has served primarily as a club for beating up the nation&apos;s under-resourced public schools. NCLB does not prevent good teachers from being creative and engaging or from teaching high-level skills. If teachers do the right thing, their students will do well on the tests. Most good teachers are unhappy with high-stakes testing, but they find it hard to ignore the tests and teach the way they know is best. Pressure from authorities and too little time to focus on both the tests and high-quality instruction are major problems. Teachers should not have to risk punishment to provide a rich curriculum. Schools should be held accountable for doing what is most important with the resources they have – not for teaching to the test and ignoring many vital goals. If the goal is high-level learning, low-level tests should not be the measurement tool; accountability tools must be in sync with high quality teaching and learning. Prioritizing reading and math is necessary. Math and reading deserve major emphasis, but not the exclusive treatment NCLB enforces. Students need -- and parents, communities, colleges, and employers want -- far more. They seek the education of the whole child, where schools help raise effective citizens and lifelong learners who are ready for adult roles. Students who struggle with reading or math still need a well-rounded education. When students are excited by science, social studies, art or music, it helps them engage in their other subjects. In short, all students need a balanced curriculum in a balanced educational environment. We can bring back science and history by testing them too. This is not the solution to this problem. Those subjects also will turn into test prep, as is happening in some states. The answer is to include all subjects in public reporting by using evidence from actual classroom learning, not just from test scores. That way the amount of standardized testing can be reduced (and tests improved), while samples of student work can be evaluated to provide comprehensive pictures of how well students are learning across the curriculum. NCLB requires "highly qualified" teachers. The law defines "highly qualified" as having a college degree and passing a test. A teacher doesn&apos;t even have to be licensed – meaning some are not even minimally qualified. Such unprepared teachers are most commonly hired to teach low-income children. Meanwhile, truly qualified, experienced teachers in rural schools are often deemed "unqualified" because they teach multiple subjects but don&apos;t have a college degree in each subject. In many cases, good teachers are leaving because they no longer want to work in a high-stakes testing environment. NCLB is improving schools and achievement. Since NCLB was implemented, the rate of improvement in reading and math on the National Assessment of Educational Progress (NAEP) has slowed, even though more time is spent on those two subjects and less in other areas. Grade 8 NAEP reading scores have not risen at all. Test prep has artificially inflated scores on state exams. Accountability pressures have led to cheating, falsified graduation rates, and pushing kids out of school. The evidence says that test-based accountability undermines the quality of education, especially for our most needy students, even if NCLB defenders can point to isolated cases of apparent improvement. Moreover, NCLB policies actually cut money available to schools that need improvement. Alternative assessments are too expensive, too complex, and rely on teacher judgment. A modest investment in high quality assessments would provide immense educational rewards. Making and using performance assessments helps teachers become better. A wide array of learning evidence can be quantified for those who want numbers, while richer information is available to educators and parents. Other nations – including many with strong education systems -- rely primarily on verified teacher-based evidence. Surveys show teachers to be far more trusted than politicians, who often push standardized tests as a panacea. Standardized tests and reviews of samples of teacher-scored student work can be parts of the verification process. For this approach to work, our nation must invest in our teachers so they are, among other things, good assessors. Has No Child Left Behind “Left Behind” Minority Students? President Obama to Overhaul "No Child Left Behind"